New Roman Missal for Middle School Youth - Word for Word by Life Teen from Life Teen on Vimeo. This stained glass icon of Saint Joseph, the Father of priestly sons, is a homage to our patron saint and an invitation to us, his Josefino sons, to imitate him as our father. The saw celebrates the work of Saint Joseph by which he supported his family composed of Mary and Jesus and built up their home in Nazareth that is an analogue of the Church. As we take pride in having as our motto “in opus ministerii,” we are called to imitate our father as diligent workers and effective builders not only of concrete physical structures but also of God’s family, the ecclesial community. The lily is a symbol not only of the purity of Joseph but also of his justice (“the just shall blossom like the lily” Hos 14,5) and his great faith in God (“consider the lilies of the field” Mt 6, 28 cf. Lk 12,27) who sustained him in every need. Indeed, the Church has turned to Joseph as the exemplar of that “good and faithful servant whom the Lord has set over his household....” (Mt 24, 45) The lily is thus an invitation to imitate our father in his single-hearted holiness and trust, especially as we hold positions of leadership in the household of God that is the Church. The ring is a symbol of faithful love used at marriages in many societies including the Jewish people in the time of Jesus. Here, it signifies the fidelity and devotion of Joseph to Mary, his wife, who is also a type of the Church. Joseph is rightly called “the most chaste spouse of the Virgin Mary,” not simply because he withheld himself but rather because he gave himself singularly and purely to her. In this way, we his sons are called to imitate our father in undivided loyalty and generous love for the people of God committed to our care. The boy Jesus is shown sitting on the lap of Joseph. His sunburst halo alludes to the seal of the Society of Jesus. He cradles a lamb while bearing a shepherd’s staff in his left hand. At the same time, his right hand holds the hand of Joseph. Their eyes meet together in an affectionate gaze. 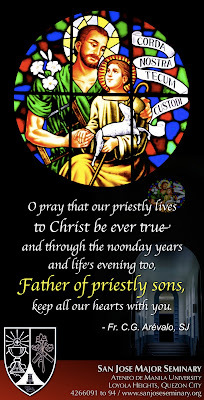 Jesus is the priestly Son of the Father of priestly sons in whose sonship and priesthood we all but share. Verily it is Jesus himself, “the Son of Joseph,” (Lk 4,22) the original Josefino, whom the icon presents for us to contemplate. The allusion in the halo of Jesus is a tribute to the Society that bears his Name who have administered San Jose with commitment and dedication from its beginnings in the Colegio de San Jose of 1601 up to today. They have endowed the seminary with the Ignatian hallmark of virtue and learning, spirituality and service which has become the distinguishing characteristic, indeed the shining glory, of our being Josefino. 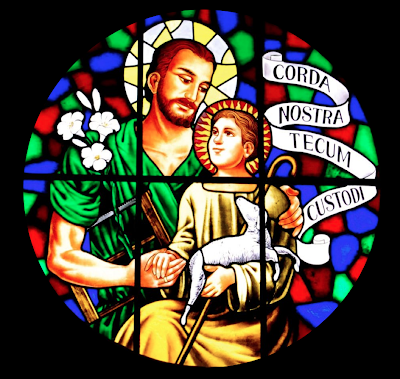 The boy Jesus is shown cradling a lamb even while he himself is cradled by Joseph. 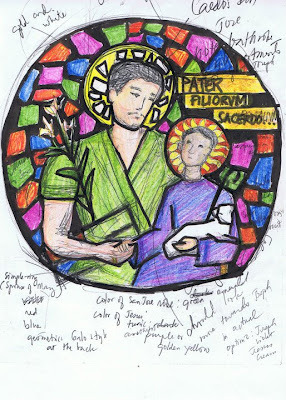 His staff mirrors the staff held by his father, which according to tradition blossomed into a lily to indicate God’s own choice of Joseph as the husband for Mary. One can feel certain that the loving devotion of Joseph taught Jesus how to care for the flock. We contemplate in the Gospel how devoted Joseph was to protecting and providing for his family. What better example of a “good shepherd” could Providence have supplied for the Savior if not this carpenter? Formed in the Josefino tradition, we too are called to become shepherds, whether ordained or lay, of the people entrusted to us by God: “Christ and his Mother to take into our care” just like our father did. As in the Caedo statue, the hand of Joseph rests on Jesus’ shoulder, our shoulder, urging and supporting us in our work of service. Our opus ministerii reflects and fulfills the Josefino spirit. Hands held warmly together, their eyes rapt in a tender gaze, we contemplate the loving intimacy of father and son. Like the little lamb in Jesus’ lap, we realize that we are also in the scene and called to enter it more and more. As Father Tom Green wrote in the prayer to Saint Joseph on the 50th year of our treasured landmark: “His awe and trust reflect beautifully the feelings we have. And your look of loving, fatherly care inspires us to trust in you as he did.” Like Jesus, we look up to Joseph our father, trusting in his providence and protection, asking him to take us and keep us in his care. The Latin inscription reads: “Corda nostra tecum custodi.” This simple prayer connects us to a venerable tradition of invoking Joseph as custos: custodian, guardian, caretaker, keeper, steward. Indeed, the Joseph of the New Dispensation who was entrusted with God’s “greatest treasures,” Mary and Jesus, fulfills the great figure of the Old Testament who served as steward of Pharaoh’s treasury and in this way helped save many people. Thus, he has rightly been honored in the liturgy and in popular piety under this title (e.g. “Virginum custos et pater”) and his patronage, Saint Teresa of Avila tells us, has never been found to fail. The brief encyclical on Saint Joseph written by Blessed John Paul II was entitled Redemptoris Custos. Indeed, Joseph was not only the custodian of Mary and Jesus but continues to be called upon today as the guardian and protector of the Universal Church. Hence, we do well to implore him with confidence to take not only our seminary but our hearts into his care, especially as priests and seminarians, that he may foster and form them as he did the Heart of Jesus. He who was the formator of the Formator of all disciples!